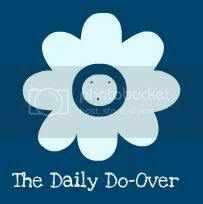 The Daily Do-Over: I thought I'd have a post ready today. I was wrong. I thought I'd have a post ready today. I was wrong. Isn't it funny how you have your day all planned out, and then it gets so turned around that you don't do anything you wanted to? That was me today. Writing a blog post was supposed to happen, but didn't.